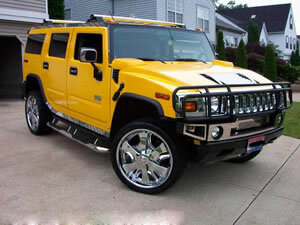 AMG (AM General) is famous in the world due to the production of the civilian Hummer and the military Humvee. Uzziah, the founder of AMG, is a bicycle manufacturer. He set up Overland Car Department in 1903. In 1908, John Willy bought Overland Car Department and founded Willys-Overland Automobile Company in 1912. Hammer steel wheel rim adopt independent torque pole, single pipe gas shock absorption, former WenDingGan/5, variable spring, variable air bearing, LT315/70 R-17 tire and so on. Wheel brake: H2 6.0 AT. Wuxi Hengsheng Wheel Co., Ltd is a professional Hammer steel wheel rim manufacturer and supplier in China. In addition to Hammer wheel rim, we also provide other famous models steel wheels (rims) for our clients around the world, like Mitsubishi wheel rim, NISSAN wheel, OLDSMOBILE wheel, PONTIAC wheel rim, SAAB wheel, Saturn wheel, Scion wheels, Subaru wheel, Suzuki wheel rim, Toyota wheel, Mini wheels (Mini rims), Volvo wheel, etc. We possess a professional technology team to guarantee the manufacturing of Hammer steel wheel rim. We will checkout all the products and give out a survey report. According to the needs of every client, there will be a dynamic balance sample survey among parts of the qualified Hammer steel wheel rim.